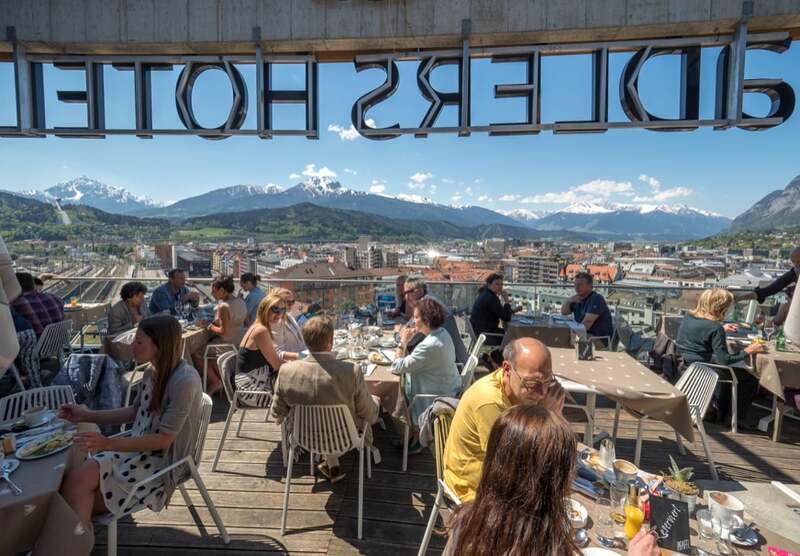 If you haven’t yet flown into Innsbruck, you must. It is an aviation marvel, where you dive down between 2 mountains and land in the centre of a valley. I think perhaps one of the most unnerving things about the flight, is that as you come down, your view out of the cabin window is no longer sky but is instead is the side of a mountain on both sides, while you remain quite high in the sky and are quite some distance from landing. Once on the ground, Innsbruck Airport is a small local airport. One of those airports that enables you to climb down from the plane and stroll across the tarmac to the airport. 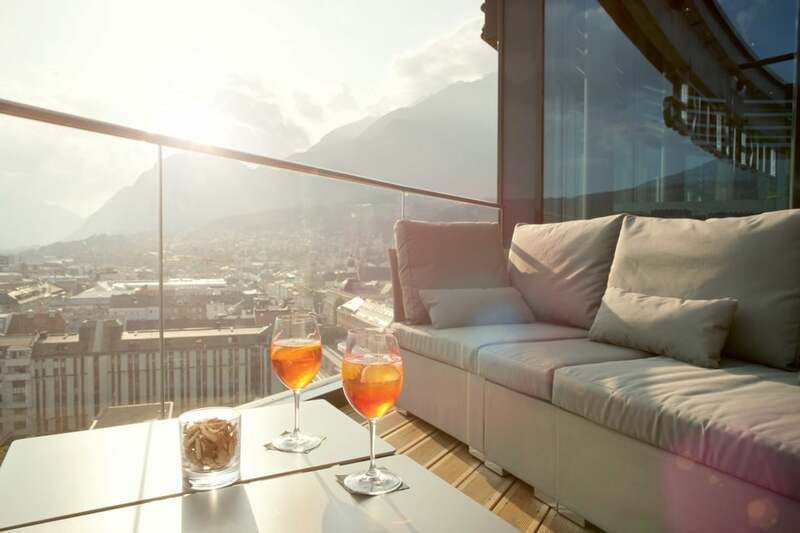 You can fly into Innsbruck from Heathrow with direct flights on British Airways or arrive from Gatwick on Easyjet. 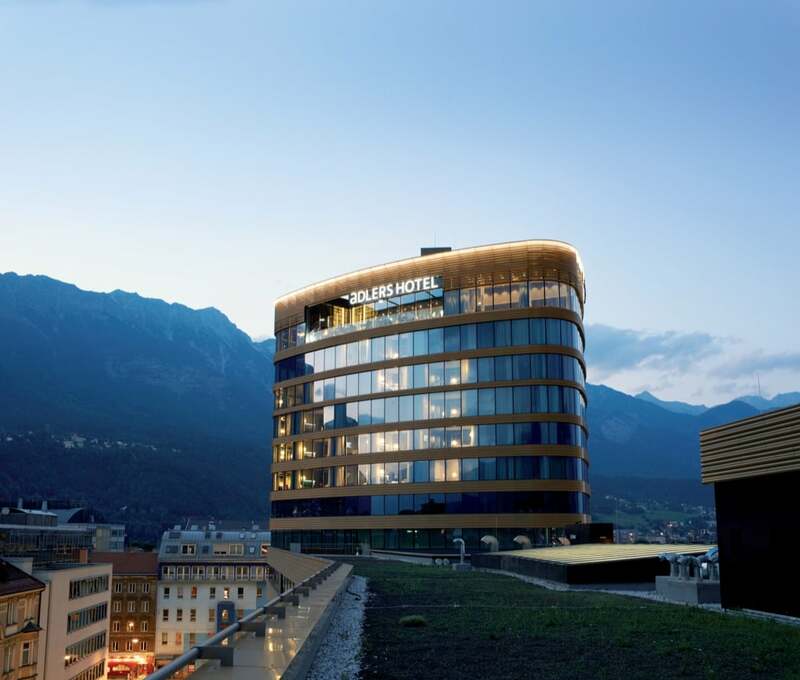 Innsbruck is a great base for exploring the surrounding mountains as well as offering a pretty shopping area in the historic old town. In fact, my favourite thing to do from Innsbruck is to ski. 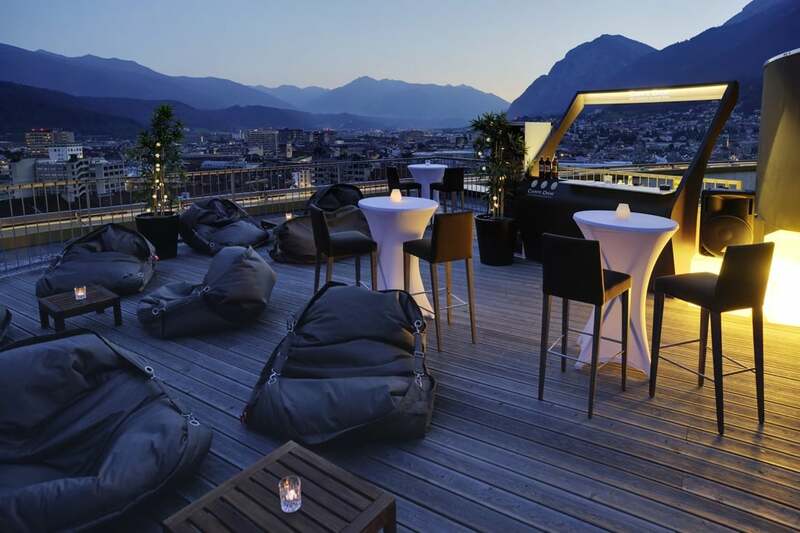 Having hosted the Winter Olympics in 1964 and 1976, Innsbruck knows quite a bit about winter sports. Skiers and snowboarders have access to over 500 kilometers (310 miles) of trails in 25 surrounding village resorts all on one reasonably priced ski pass, and connected by a free ski bus. 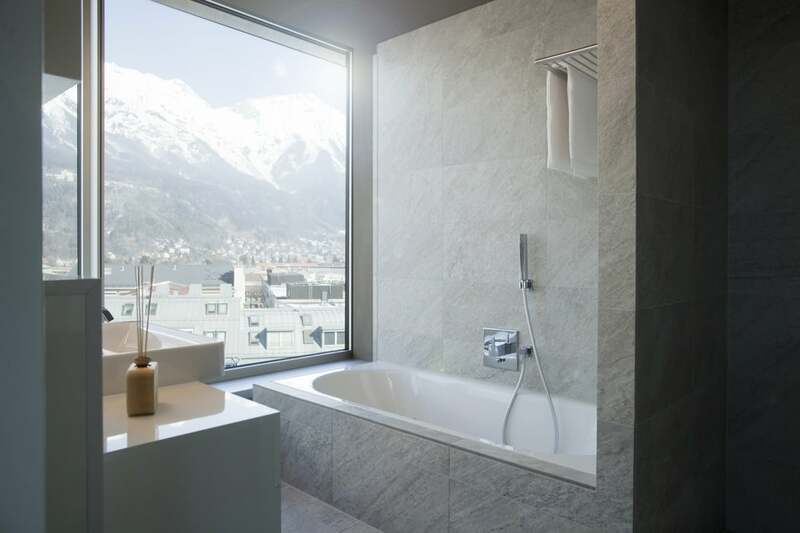 Most noteworthy, is that you can ski from Innsbruck right through from October to May, on the Stubai glacier which is around a 45 minute drive from Innsbruck town centre. 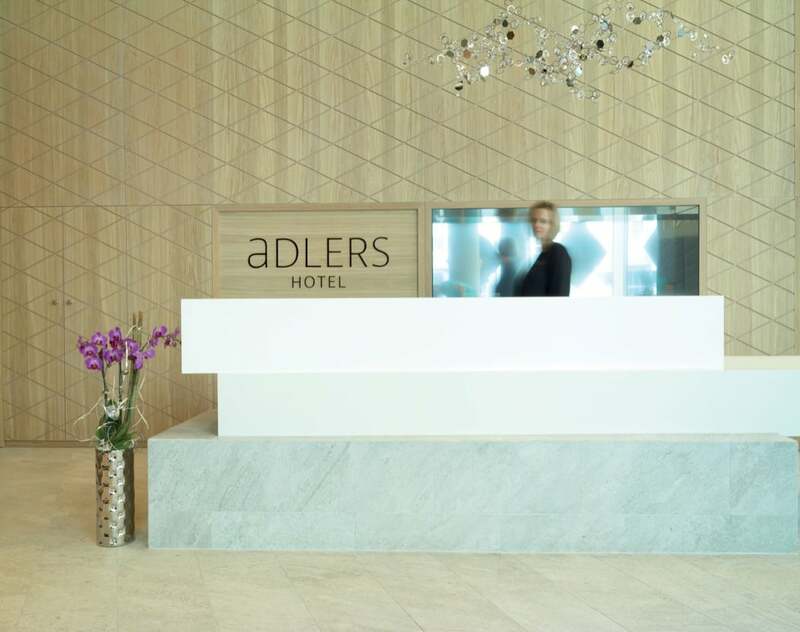 aDLERS Hotel Innsbruck is a modern and stylish hotel with a modern and luxury look. 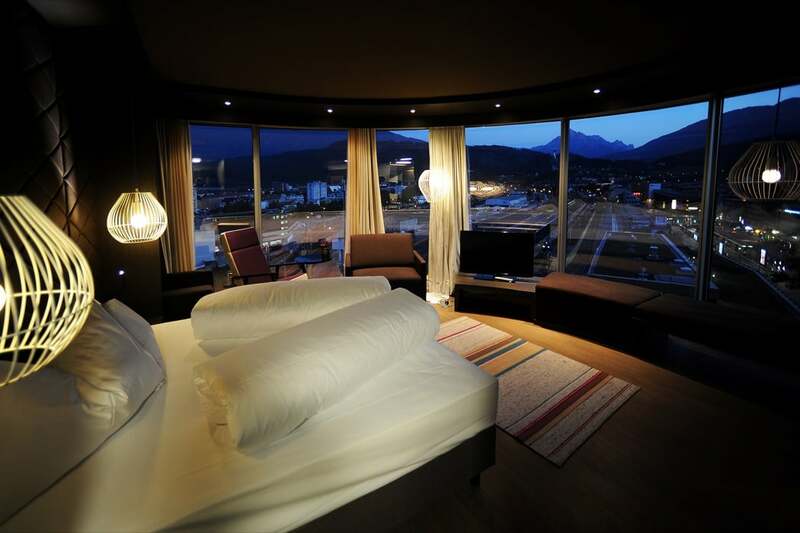 It is located in the tallest building in Innsbruck and has 75 “panorama” rooms which offer incredible views across the town and to the mountains behind. 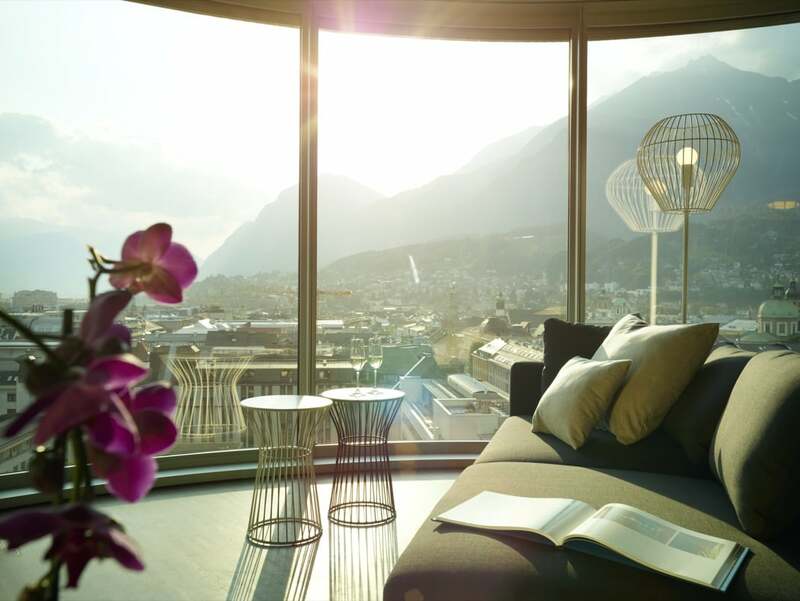 The rooms are all about the views over the city and mountains. The rooms themselves are actually very stylish in a minimalist way. Designed in hues of chocolate, greys and creams, with splashes of colour and dark wood floors, they feel luxurious and welcoming. Modern rocking chairs or loungers are placed by the window so that you can enjoy the vista and facilities include the latest flatscreen tvs and modern bathrooms, some of which also offer the incredible views. 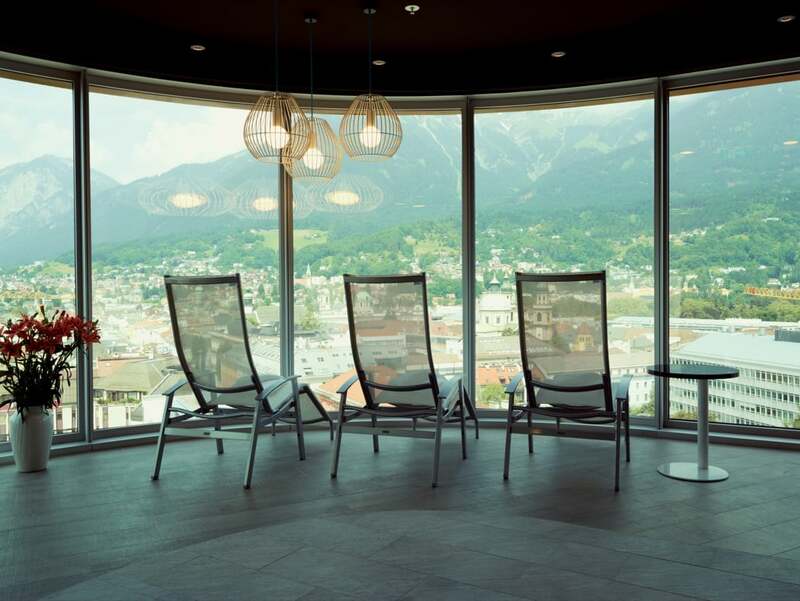 There is an impressive Spa offering the same amazing views across Innsbruck and over the surrounding mountains. 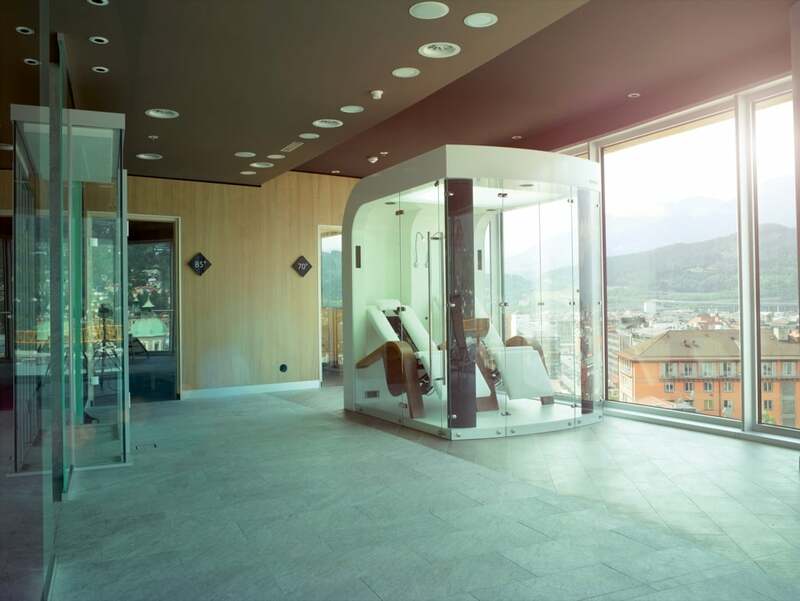 Within the spa there are massages on offer along with three saunas and an infra-red cabin. The hotel also offers free passes for the McFit health club next door. 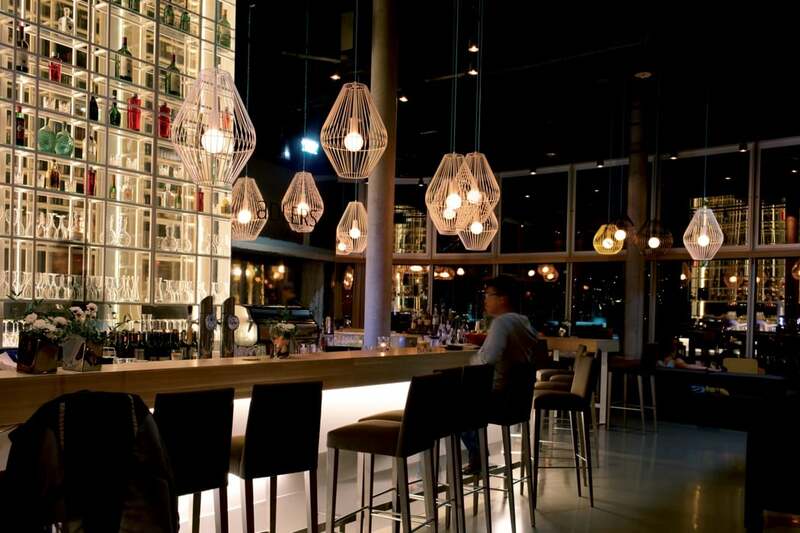 Savor excellent international cuisine and great views from the trendy bar, restaurant and terrace on the 12th floor. In fact, the outdoor Panorama Terrace has a DJ on Friday and Saturday nights so is a fun place to be. There is also live music for their Sunday brunch offering.